The end of the retail release of the Ranger Keys toy line from Power Rangers Super Megaforce has come – the final keys have been released at Toys’R’Us stores. That being said – we decided to take a look at these keys in what we’re calling the Ranger Key Celebration Week here at TokuNation.com! Before we look at the Power Rangers Jungle Fury B assortment of Ranger Keys, please take a moment and check out our previous Ranger Key galleries! Easily one of the best sets in the bunch, the Power Rangers Super Megaforce – Power Rangers Jungle Fury Ranger Keys Set B comes with three awesome Ranger Keys – a translucent Jungle Fury Wolf Ranger Key, a translucent Jungle Fury Yellow Ranger Key, and a Jungle Fury Rhino Ranger Key. For those who don’t remember – the Jungle Fury Wolf Ranger was one of the finalists Ranger Keys from the Morphin Madness contest from 2014 but ultimately did not end up in the Final 5 Winners. The normal version (well, kind of normal) of this Ranger Key was available as a Power Morphicon 2015 exclusive. 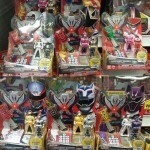 You can find that gallery, which also features the Titanium Ranger, by clicking here. This set completes your Power Rangers Jungle Fury Ranger Keys collection – the Jungle Fury Red Ranger, Jungle Fury Blue Ranger, and normal version of Jungle Fury Yellow Ranger were released in the initial release of the Ranger Keys. Speaking of which – how cool is it to have a translucent key of a female Ranger? It turned out real nice and we’re big fans of it. Check out the full 25 image gallery by clicking here or by clicking the “Discuss” link at the end of the post. Do you plan to pick up this set, or have you already? Is this not one of the best sets of the entire wave? Sound off in our discussion thread! TokuNation is back with another in our series of Titanium Powered galleries. But this time there’s a dose of something extra! 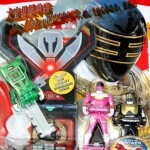 With today’s gallery we take a look at the recently released Power Morphicon 2014 Exclusive Ranger Key Set! This set includes two of the most hotly demanded characters from Bandai’s Morphin’ Madness competition and in fact, these two went head to head in the final round. It’s Lightspeed Rescue’s Titanium Ranger & Jungle Fury’s Wolf Ranger! This pair of keys was made to coincide with the Power Rangers Super Megaforce toyline and are entirely functional with the Legendary Morpher. When either key is used with the morpher the “Power Morphicon!” phrase is uttered and this special set is the only way to get either of these rangers in key form here in the US. Wolf Ranger, or rather his original counterpart Geki Violet, was released in the Gokaiger toyline some years back but the PMC exclusive is the only way to own an american version of the key. Titanium Ranger however is a 100% original creation of the Power Rangers franchise! With no sentai counterpart he has never had a Ranger Key produced of him. So that makes this release truly special! Check out a full 40 image gallery of this set after the jump by clicking “Discuss on the TokuNation Forums” at the bottom of this post! Special thanks to site owner and admin Kickback for being awesome enough to pick this set up for me at PMC. Just because there wasn’t an official update from Power Morphicon this week doesn’t mean that news didn’t break! For starters – if you haven’t registered yet we’re sorry to inform you that registration has ended. To attend the show you will now have to buy a pass at the show the day of the show each day. We can’t say we didn’t warn you though! And now for the rest of the news! It was announced that there will be an official tournament for the defunct Power Rangers Action Card Game! For those who collected, sets one through four were released here in the United States, while set five was released only in Europe. However, the tournament will be open to anyone who would like to participate and they can use any of the cards and promo cards ever released. There will be prizes for the winner(s), including an entire set of the unreleased series 5 and more! Stay tuned for updates on how to enter so you can play. Now on to the sad news – Jason Smith, better known as Casey the Jungle Fury Red Ranger has cancelled his appearance at the show. He has promised, however, to do some fun fan related events, contests, and so forth in the future. But we can’t end on bad news – so let’s bring up some good news! Previously cancelled guest Alyson Kiperman, who played Taylor the Wild Force Yellow Ranger, has rescheduled to appear on Saturday only! This is great news for those who were bummed about their Wild Force group photo opportunity. Don’t forget to get to the show early so you can grab your Jungle Fury Violet Ranger & Titanium Ranger Key Pack Exclusive – a sure-fire hit as it looks to be the only way to get the Titanium Ranger key! TokuNation.com is proud to be attending this year’s Official Power Morphicon and will bring you any news as it breaks, as well as tons of pictures and so forth. Our coverage will be light – we’re going as fans! We will be joined by our good friends from the Ranger Command Power Hour Podcast, and a group event with our own Talkin Toku Podcast is being planned. We’ll see you at the show! Continuing our celebration of the 20th Anniversary of Power Rangers, the users at TokuNation.com voted the actor David de Lautour (RJ, the Wolf Ranger of Power Rangers Jungle Fury) as the 9th Best Power Ranger of All Time. When Master Mao passed away, he sent forth three of his students – Casey, Lily, and Theo – to the city to find their new master to continue training them to stop the evil of Dai Shi. Enter Robert James, aka RJ, the man in charge at Jungle Karma Pizza. A bit of a loner with a unique form of training for his students, RJ surprised them (and us to an extent) when he overcame the wildness of his Wolf Animal Spirit to become the Jungle Fury Wolf Ranger, helping the other Jungle Fury Power Rangers in their battle against Dai Shi. RJ holds the title of, currently, the only purple colored Power Ranger in the franchise’s history (at least for another 4 years until a possible Kyoryuger adaption is brought over). Couple that with the brilliant acting of David de Lautour as RJ and the great writing for the character, RJ is a great selection for the 9th Best Power Ranger of All Time. 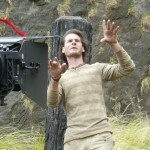 Born in 1982, David de Lautour is no stranger to acting, having started back in the late 1990’s in brief roles as Icus and Lief in the hit-show Xena: Warrior Princess. Easily best known for his role as RJ the Wolf Ranger in Power Rangers Jungle Fury and for doing the voice of Vergil in the Devil May Cry, he has also recently had a guest appearance role in NCIS: Los Angeles and continues to work on various film projects each and every year. Congratulations to David de Lautour on being voted by the TokuNation.com users as the 9th Best Power Ranger of All Time! What do you think of this selection? Do you agree, disagree? Where would you have ranked RJ? Let us know! And stay tuned for the next update as we close out the year with selections 1 through 8! All times are GMT -4. The time now is 6:04 PM.